Good day, friends. After our research trip out West, I cannot get out of my mind the idea of land rights. We spoke with some natives and one in particular, Phillip, discussed for thirty minutes, the stories of contemporary property battles between the Native Americans and National Americans. It amazes me that in a day of precisely drawn GPS located boundaries, that we can still dispute land in North America. As if the behaviors of our past treatment to Native people were not bad enough, we still attempt to use, old mapping excuses, easements, and rights of way to further take land from the original “owners.” Phillip told us of an American Indian that had been leading protests against the National Park Service’s attempt to assimilate an “easement” between a native road and the park boundary. Apparently, the Natives lived on property adjacent to the boundary of the Park and created an access road on their property. A few years ago, the surveyors came through and claimed that the road was the boundary and that the “Indian Property” was actually an easement for the park. The opponent, organized tribe members to publicly dispute the fact that the U.S. Was stealing more of their land. He began retracing the Fed surveyors, pulling ground stakes and property signs as he went. Eventually, his burned body and vehicle were found in the lake bordering the two sites. The investigation turned up no possible murderers. The other amazing fact, at least to me, is the fact that many of the tribes still do not recognize themselves as “Americans.” Especially the Navajo, who refer to the North-East quadrant of Arizona as the Navajo Nation. After speaking with the locals, it seems that Interstate highways crossing their land is just an inconvenience. They have their own roads, as well as their own schools, services, and penal systems. I was astounded at the amount of autonomy still present in the Native communities. One last thought on location, more specifically, re-location: Originally, the U.S. Government had decided in the late 1820’s that they had taken enough land and would begin honoring treaties. As some of the Southern States became irate of the fact that Natives were gaining rights, (to include slave ownership), they rose up and fervently expressed their discontent with the Federal Government. 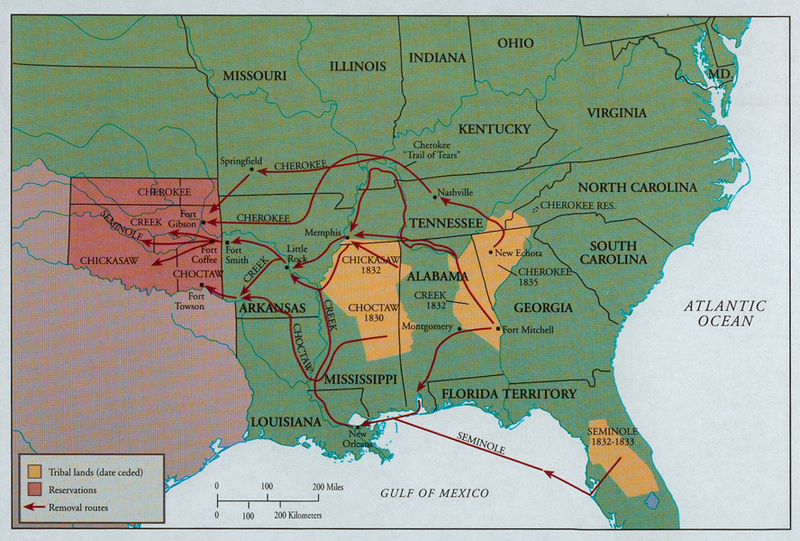 In fear of starting a civil war, John Quincy Adams, withdrew federal troups from the South and proceeded with the re-location of 46,000 Natives (only 70% which made it alive to their new homes). Wow that is amazing information… Where did you run into Phillip at?